Nord-Trøndelag ("Northern Trøndelag") is one of Norway's 19 counties. 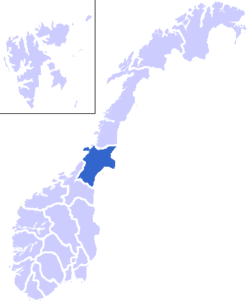 The county seat is Steinkjer, and the largest cities are Steinkjer, Stjørdal, Namsos, Levanger, and Verdal. The local government is dominated by the Labour Party, while the Centre Party serves as the main opposition party. Since the 2011 elections, the ruling coalition has been made up of the Labour, Conservative and Christian People's parties. The county is traversed by Trondheimsfjord and Beistadfjord. The landscape is pretty rough, except for the areas surrounding Trondheimsfjord, which are very suitable for agriculture in a Norwegian context. The agricultural sector of Nord-Trøndelag is one of the largest in the country. All of Nord-Trøndelag's larger towns are connected by rail. One of Norway's major roads crosses the county and follows the railway. This page was last modified 13:51, 13 July 2012.